There is little doubt that the economy is not healthy. I have used the term “Managed Depression” to describe it, claiming that we are in a long-term slowdown that is more severe than most officials and prognosticators are willing to admit. I glibly defined the term “Managed Depression” some time ago, but many people have asked me for a more rigorous one. Here is the case stated as simply as possible. What’s in a word? Why is there value in calling this a “Managed Depression” or anything else using the dreaded “D Word”? There are two reasons. The first is that a sense of urgency has been missing as our politics and news analysis has been easily distracted by side issues that seem expedient. The second is that while a Depression is an unusual event historically, it’s not without parallel. We’ve learned a lot along the way and know something about how to handle it. But we won’t get past it until we’re honest and tackle it directly. What is a “Depression”? There is no generally accepted definition of the term, which dates back to at least 1819 when President Monroe used the term. The best we have is a long “Recession”, lasting 2 or more years, or a decline of real Gross Domestic Product (GDP) of more than 10%. The chart below explains how we’ve fared over the last decade. Data is taken from the St. Louis Federal Reserve’s excellent site whenever possible. The green line is the official change in real (inflation adjusted) GDP from year to year, which shows how there was a Recession in 2001-2002, some robust growth before the big crash in 2007-2008. 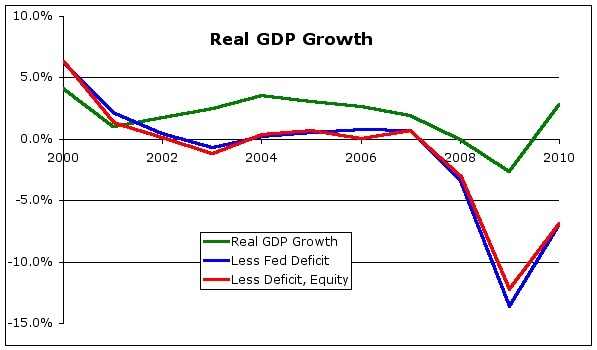 Take out Federal deficits over the same period we have the blue line. Taking away the net change in home equity withdrawals, which peaked in 2006 at 2.7% of GDP, and the red line shows that real growth hardly became positive over the last decade. This means that all of the rest of the economy – everything except Federal deficits and home equity cash-ins, has not been growing for a decade. Both general definitions of a “Depression” would have been met in turns over this last decade. Here is another chart, showing the percent of the population that is in the workforce, taken directly from the St Louis Fed. The shaded areas are the “official” recessions. Peak labor force participation was 64.5% of our population, but in the last decade fell to 58.5%. The first “Recession” shows a substantial drop, but employment as a percentage of the population continued to drop even after the official end of that event. It scratched up a bit by 2007 before falling dramatically. There are many more ways of telling this story, but these are the most dramatic. They link the two Recessions into one larger event, a Managed Depression where the only real growth came from Federal policy. The government itself ran a large deficit while the Federal Reserve kept interest rates low, encouraging refinancing. Without those policies the two Recessions would clearly have combined into one very clear Depression. That is what makes this Managed Depression different from the Long Depression of 1893 or the Great Depression of 1929. In a sense, our system worked perfectly. As President Obama said, “Our action prevented a second Great Depression”, and that is very much backed up by the data. A cynic would say that rather than providing clear management the government has done little more than “paint the tape” – manipulate the economy so that the right numbers come out at reporting time. That’s the pitfall of a Managed Depression. If the system worked to technically prevent a Depression, what’s the problem? Why worry about whether we call it a Managed Depression or a Great Recession or a banana? A Democratic-Republic requires engagement in politics, the operating system of a government by the people. The illusion that this Managed Depression is under the control of those in charge has allowed us to be distracted away from the seriousness of the problem. History shows that the economy that emerges from a Depression is very different from the one that collapsed at the start. Resources are allocated to a new reality and everything comes back to life. Some of the greatest periods in US history came the Restructuring after a Depression. The charts shown above show that there was a distinct change in 2001, right about 9/11. With the death of Osama bin Laden and the tenth anniversary of this event coming up it is time to focus on what really happened to our economy since that time. The Managed Depression should not be blamed on a particular president because the system worked exactly as it was supposed to. That means that this particular Managed Depression has not been like the many others in US history. We learned something and did not make the same mistakes. But we may have made a new mistake – allowing our population to be easily distracted away from the seriousness of what has been happening. Calling this what it is – a Managed Depression – may be the first step towards getting our politics back into line with what is needed to emerge from this historic event with a new economy, possibly one that is stronger than ever before. This entry was posted in Money, Politics. Bookmark the permalink. Thank you for summarizing this so clearly. You’re starting to repeat yourself! Seriously this is pretty clear to me. I guess the fact that we never recovered from the last recession does bring all our definitions into question. That point alone should be made much more clear because it shows there is something seriously wrong. I want to hear more about the debt we piled up by doing this. I can see that preventing a real depression is a good thing but there seems to be a hidden cost to this “Managed Depression” as you call it. Perhaps its better to just let it run its course like a fever? Thanks, everyone. Jim, I have been getting a lot of questions lately as to what the Hell I was talking about as I use the term “Managed Depression” pretty often. I hate to repeat myself, but the discussion of this stuff goes back nearly 4 years and it’s a bit disjointed. New people are reading me and I have to explain this. Besides, I do think things changed very suddenly here and we are about to get real (I hope!). Would it be better to let the Free Market just run its course? In the long run, the answer is a definite “yes”, IMHO. However, people have this strange habit of eating every day. A hungry population is a dangerous population and can cause a lot more destruction than the Depression itself. Then again, some creative destruction is always necessary. I think we may have tipped the balance a little too far in the “no pain” direction. I say the first thing to do is be honest about what’s going on. That may be a little pain, but it’s not much. Very good graphs. I would like you to explain your economic writing here more. There has never been a free market except for the farmer’s market. Almost all powerful people if they are nationalists, doctors, lawyers, businessmen argue for the free market in theory but in practice tend to be against it. I think the pain has been disportionate. Going back to EF Schumacher and catholic social teaching there is such a thing as the universal destination of goods. This is not what most people think it is, it protects private property within reason. But first and foremost it has a preferential option for the poor (the unemployed). Now you go work it out I gotta go back to reading Jim Thompson (3 books in 1 week) he is a great writer!!! I forget to mention wall street bankers. I also forgot to mention the issue of subsidiarity, which is the real political question, but it is highly prone to shape shifting (except in some more clear cut example like Scotland). OK. To make it clear here. In the 1980’s (with foreclosed steel mills and smaller run family farms and the local communities that grew up around such units of production) people suffered. In the 1990’s and beyond with finance trumping industrialization, people suffered. De industrialization is socially devastating. You have to have a DIVERSE labor demand of businesses/enterprises MATCHING the DIVERSE supply of the whole labor WORKFORCE. For example most people will never master calculus and many will not be able to read at a post college level. I will quit writing now. I promise. The building trades boom of the 2000’s was an illusion built by cheap money. OK. 1. Destination for which all is created. 2. Setting aside for a specific purpose. Been super slow to respond – turned into a bizzy day. OK, Dan, I agree that a real Free Market is strictly an ideal that has never been realized. As I’ve written before, pure Capitalism is very often in opposition to the Free Market, something that people never seen to quite “get’ ’round here. I’ll go as far as to say that it is probably true that we only have these periodic Depressions because there is no real Free Market in practical terms. No time to think now (working) but isn’t the classic business cycle, a recession? Overproduction followed by lags, equilibrium, shortage and the cycle goes on…. I’ve been referring to this “recession” as a Depression for some time, because, as you’ve said, you have to name it to tame it. Dan, in many ways Depression is more than just a severe Recession. I think the real issue is that in a Recession a major industry has to restructure, but in a Depression the whole economy has to. It seems to be something that happens every 2 generations, so there is something about investing / work habits in there, too, I think. jd, good to meet ya, and “have to name it to tame it” is a tag line far to excellent for me to avoid stealing at some point! 🙂 I think most politicians and economists are being cowards on this one, I really do. I agree to a point. In a recession a major industry may or may not restructure. There will be layoffs, followed by hopefully some priming of demand thru easy money/credit, advertising and lower prices for the time being. As for a depression there is a major technological or structural change, the late 20’s and early 30’s i.e. electricity, farm mechanization and lax regulation. We certainly had leaders asleep at the switch in the 2000’s, lax regulation, no tax increase during wartime, give ways to the wealthy and Wall street. An author of the Age of Fracture thinks to some degree there is no macroeconomics any more its all microeconomics. I don’t think there really is a macroeconomics, and to be honest I never really did. It’s a question of how you can possible add up all the microeconomic effects into one big integral. That’s what gets me talking about Connections Theory and all that other stuff. I’m also a huge fan of Game Theory for this reason. Age of Fracture? I call this the Fractal Era, never heard the other term. A very interesting discussion. I agree with @jdhays re: “name it to tame it,” and Erik, I think we have had the discussion before that this is a depression. As I tweeted to you earlier, I have wondered for some time if fully employing 2/3 of the population is a sustainable trend. 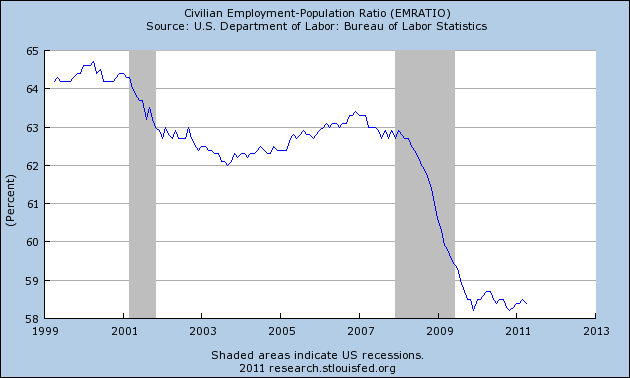 I don’t think it is, and I think that is one picture the graphs make clear: the jobs are not returning. The next “bubble” I’d like to see addressed is the “education bubble”–more precisely, higher education. We keep telling students that they must go to college, yet the figures indicate that only 25% of college grads are finding adequate employment within their fields of study. Does this mean that the other 75% would have been better off not attending college? At least in the short term, I think it does, but if 75% of students stop attending, we’ll have another crisis of epic proportion on our hands. I’m a little slow to this but I happened across it. I agree that not everyone needs to go to college and I don’t know why we have it set up to encourage people to do this. It’s a lot of debt for most of them and it does not guarantee a job. I think this is the best summary of what is happening in the economy that I have read. You don’t blame anyone or make a political point but just lay it out plain. It is very clear to me that not just politicians are failing us but the media AND all the people that they claim know whats going on. it is all one big lie. Thanks for getting past the bs and saying it the way it is so that we can make up our own minds whats really going on. There can’t be any doubt that this is a Depression and I can’t thank you enough for laying it out in such a simple way. Erik, Martin Wolf of the Financial Times introduced me to the idea that the Panic of 2008 and what followed pulled the rich world’s future forward by about a decade. Everyone knew budgets would be pinched as the Baby Boomers retired (10,000 a day in the U.S. reach age 62, eligible for Social Security benefits). The governments of rich countries both bailed out private banks and tried (via fiscal stimulus) to augment demand that fell off a cliff after Lehman failed and the panic ensued. This one-two punch, all financed with borrowed money, pulled the fiscal squeeze forward sooner than most expected. The Wolf column appeared on p. 11 of the U.S. edition Feb. 2, 2011. Almost anyone with a library card can retrieve it. I am a well-read public speaker, a busted-down newspaperman and strictly an amateur as an economist. My broad take is that to solve the problem of promises made that have not been paid for and that cannot be paid for without a crushing tax burden on our children and grandchildren, everyone has to take a hair cut. Hair cuts in fact have already begun. Just ask the retiree who’s renewing a CD at today’s pitiful rates. Or the teacher, fire fighter or park worker who has just been laid off. Of even the toddler in my neighborhood whose kiddie pool is open only alternate days during the summer. It is not a question, in my view, of raising taxes, gradually raising the retirement age, means-testing all social-insurance benefits, encouraging more private savings and disabusing citizens of the idea the government can support them in style in retirement. We have to do all of these things. Everyone has to take a hair cut. The depreciation of the dollar — the flip side of record prices for gold, oil, wheat, what have you — is a hair cut, if a silent one. The political debate will continue to be who gets a close shave and who gets to wear their hair long. The phrase fails to take into account that while the First World’s middle class fared poorly in the 2000-2010 period, millions upon millions around the globe enjoyed rising standards of living. In India, entrepreneurs have designed small refrigerators with few moving parts that dramatically improve the quality of life for the poorest. Cell-phone usage is common in some of the poorest parts of Africa. These and countless other advances makes a difference. A farmer with a cell phone, for example, can call ahead to see if he/she can get a decent price for output today rather than wait for a better outcome tomorrow. And while I like the phrase “Lesser Depression,” the word “depression” is hard to square with the fact that in the rich world, even the poor (with some exceptions) have cell phones, automobiles, iPods, $160 sneakers, air conditioning, and so on. And enough to eat that they are more likely to be obese than malnourished (ill-nourished, yes, but not for lack of food). These are observations, not an argument that all is well with economic and tax policy. There is a line out there between “every man/woman for himself/herself” and “we are all in this together.” The line is not fixed but fluid, shifting. The political debate is about where to draw that line, how to get the incentives properly balanced. The debate will continue long after I am pushing up daisies. Michael: Thank you for your comments. I completely agree that the key to getting out of this is first understanding that we’re all going to take a hit – in the developed world, as you note. That is why I think that the right label is so important. We need the appropriate sense of urgency.